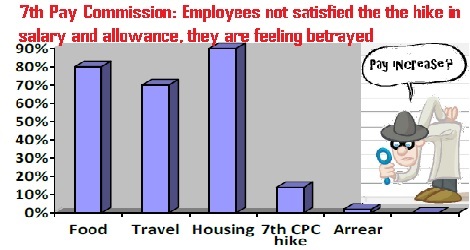 The implementation of the 7th Pay Commission has sparked resentment among the Central government employees. 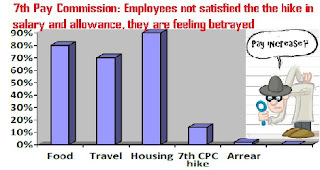 Not satisfied with the hike in salary and allowances, they are feeling betrayed. While some financial experts opine in favour of the government decision, the ground reality seems to be far different. And it is evident from the fact that 32 lakh Railway employees, for the first time in 42 years, had decided to go on strike; and also other Union government employees, including workers of India Post and defence factories, raised voice against the hike amount under the 7th Pay Commission. Something that is being mostly heard from the Central government employees is: The Seventh pay commission recommendations are totally against the expectations and the Narendra Modi-led BJP government has cheated the mass. “Finance Minister Arun Jaitley had made promise to increase the minimum pay of the employees beyond Rs 18,000 but even after our long wait it never happened, he just betrayed us. Our Dearness Allowance (DA) was also reduced; it also put cap on different beverages and grocery items we were earlier getting from our defense canteen stores,” said an armed forces official. The present salary hike, at current levels, is the lowest in 70 years. People in the armed forces are feeling cheated and deceived. The government should reconsider its decision, he added. “With the minimal hike in salary, we have to now stay for another 10 years. Does the government at all realize the plight of the Central government employees. There are also news that the government is planning to form pay commission and increase the salary and allowances annually. It’s a good decision but there is also news that it is setting a platform to make our life hell by introducing “pay as per performance. Who is going to decide our performance- our seniors or the government?” questioned an official of Central Income Tax department. Such thing will only give rise to ‘chamchagiri’ and the whole environment will be manipulated. To be candid, it will make us suffer more in the coming days, he lamented. “Can you believe, the government decreased House Rent Allowances (HRA) to 24 per cent, 16 per cent and 8 per cent for X, Y & Z cities? Nothing such had ever happened. The ratio of pay gap between lower paid employees and top officers has also been increased. The 6th Pay Commission was indeed a bonanza for us, but the 7th Pay is just a nightmare,” said another employee from the department. The government shouldn’t have approved the HRA recommended by the pay panel with slight modifications, he added. This govt pushes into the ditches of bankruptcy. Please don’t use words like Bonanza. It irritates – commented an Administrative Officer (AO) at Geological Survey of India, Marine & Coastal Survey, Kolkata on the pay commission hike being termed as Bonanza. “The hike in allowances has been decided by the government taking into account its impact on inflation. Up to 5th Pay Commission, the government employees were lowly paid but things changed after the 6th pay scale; the then the employees celebrated on one end while situation had worsened and a steep rise in inflation was witnessed on the other hand,” said an Assistant Section Officer at Orissa State Secretariat. The decision of the BJP government has indeed disappointed the central government employee section. The government need to come up and discuss with the employee unions and resolve the issue soon; it must not sit idle and blind else it will have serious political and social ramification, the officer added. On the other hand, defending the government’s decision, some believe that tight fiscal situation forced the government to take such steps.